"Whatever it is, you used to be one thing… and now you're something else." Sony Pictures has unveiled the first teaser trailer for the Venom solo movie, a new sort-of spin-off from the Sony Spider-Man universe, focusing on the fan-favorite symbiote villain character. Tom Hardy stars as journalist Eddie Brock in this movie, directed by Ruben Fleischer (of Zombieland, 30 Minutes or Less, Gangster Squad). As usual, Sony has released two trailers - a domestic and an international teaser trailer - to give us a quick introduction. There's some cool footage, but no actual shots of Venom (in full) revealed here yet. The full cast includes Michelle Williams, Jenny Slate, Riz Ahmed, Woody Harrelson, Michelle Lee, Sailor Larocque, Reid Scott, and a rumored appearance by Tom Holland as Spidey. I'm curious but still not entirely into this yet, maybe with some better footage, because I trust Fleischer knows what he's doing. Get a look below. One of Marvel's most enigmatic, complex and badass characters comes to the big screen. From Wikipedia: Development on this Venom film, a spin-off from the Spider-Man franchise, first began with producer Avi Arad in 2007. After going through various iterations, an R-rated standalone film was confirmed in March of 2017. The intention was to begin a new shared universe featuring the Marvel characters to which Sony has the film rights, though Sony also intends for the film to share the world of Spider-Man: Homecoming, which is set in the MCU because of a deal between Sony and Marvel Studios. Rosenberg and Pinkner were set to write, with Fleischer and Hardy brought on-board in May 2017. Filming began in October, in Atlanta and New York. Venom is directed by American filmmaker Ruben Fleischer, of Zombieland, 30 Minutes or Less, and Gangster Squad previously. The screenplay is written by Scott Rosenberg, Jeff Pinkner, and Kelly Marcel. 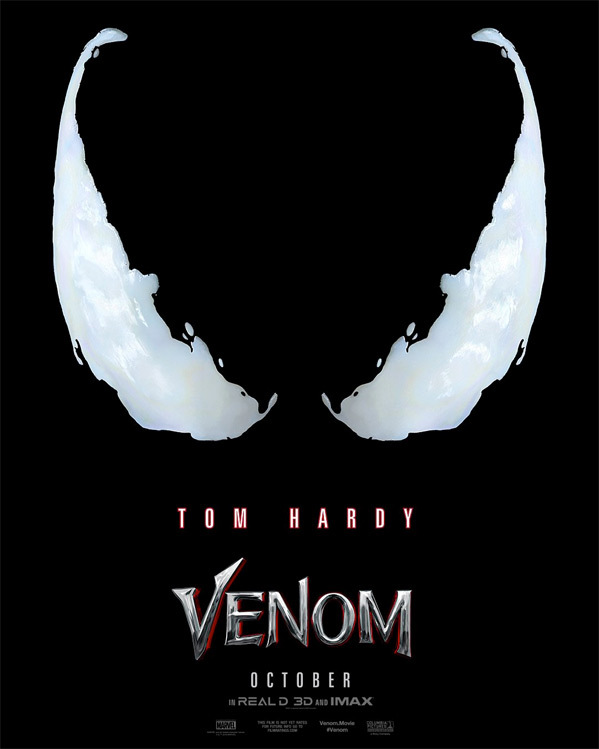 Sony releases Venom in theaters everywhere starting on October 5th this fall. First impression?